Our Speakers Bureau provides an opportunity for the outside community to really get to know the people of New Horizons Village. Residents from the Village go out to community groups to connect with them on a personal level. Our residents discuss their lives, their challenges resulting from their physical disabilities, and their achievements. They explain what life is like at the Village and present themselves in a way that enables the audience to really get to know them. Marissa was born 2 months premature and suffered a lack of oxygen to the brain which resulted in the physical disability known as Spastic Cerebral Palsy. She is also partially blind. That has never stopped Marissa! Marissa enrolled in college and New Horizons Village’s transportation services brought her to and from school for many years. On May 15, 2016, Marissa graduated with B.A. in Communications from the University of Hartford! She was also inducted into the University of Hartford’s Honor Society. Marissa is a woman on a mission, she is now training hard for a 5K race this fall. It is not an easy task to walk over 3 miles with crutches which is why her passion and determination is an inspiration to everyone that she encounters. In addition to her accomplishments, Marissa is very passionate about sharing her story with others. She wants people to see beyond her disability. Amy’s life changed in a split second when she was 17 years old. Her accident caused her to permanently rely on a wheelchair for mobility. Despite her circumstances, Amy refused to give up her independence and recovery as she had witnessed so many others do. New Horizons Village has given Amy something invaluable – a fully accessible apartment with the necessary support services so that she can live on her own. Amy has channeled her energy and focus on her artistic abilities. She is an avid cross-stitcher and she produces amazing pieces that are showcased throughout her entire apartment. 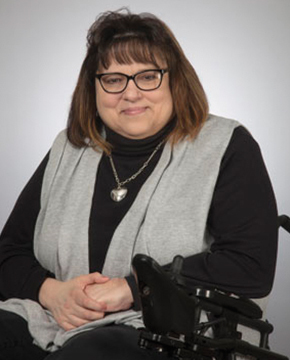 Amy’s story offers hope to other individuals who have experienced a disability as a result of a life altering event. She has found a new fulfilling life that is centered around art. Gary was born several months pre-maturely. He only weighted 2lb. 1 oz. and he had a twin brother that only lived a week. Due to his prematurity, Gary has Cerebral Palsy and he is blind. He has had to overcome more than most people could ever imagine including having to live in the New Britain Memorial Hospital for 8 years when his parents could no longer provide the necessary care for him. Despite all of these setbacks, Gary kept persevering. He left the hospital and moved into his own apartment at New Horizons Village in 1986. New Horizons Village’s support services, including our backup care system, has allowed Gary to live independently for the past 31 years. 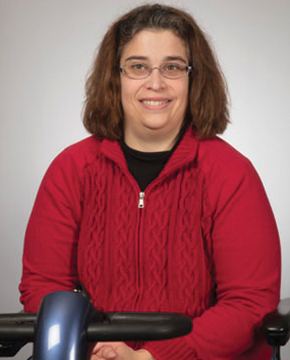 Gary earned a degree in Sociology from Central Connecticut State University and he did some graduate work at Springfield College. He is a strong advocate for the rights of people with disabilities. 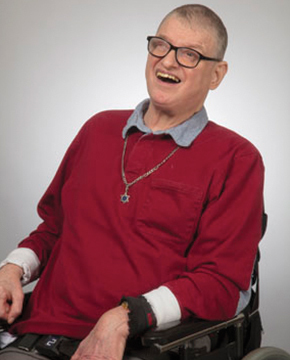 Gary is currently the co-Chair of the Citizens Coalition for Equal Access, whose mission is to promote awareness and dignity of persons living with disabilities by removing physical and social barriers at all levels of society. If you want to find out more about New Horizons Village from those who actually live here, then please feel free to contact Carol Fitzgerald at 860.675.4711 to make arrangements. Our residents on the Speakers Bureau are eager to meet with you and help you know more about the experience of living in our community at the Village.